For best results with epoxy, make sure outside temperature is above 55°F. In addition to these instructions and the epoxy we have provided, you will need a few household items. 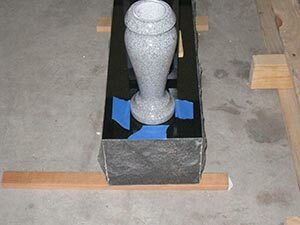 The first thing to do is identify the position on the monument where the granite vases will sit. This is usually on either side of the die (the upright portion of the monument). 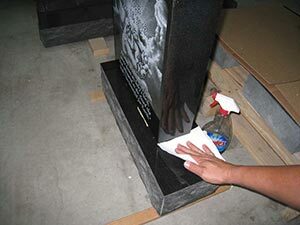 Using Windex clean the area very well making sure there is no residue left behind. After the initial cleaning, take your hand a run it over the surface you just cleaned. If it doesn’t feel like glass (that is if it is a polished surface) and you feel slight coarseness, this may be due to stubborn debris or mineral deposits from excessive watering. 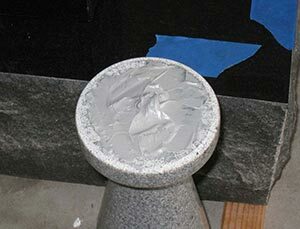 It is very important to remove this debris as you want the epoxy to stick to the actual granite and not the debris. Take your single edge razor blade and holding it at about a 45° angle scrape the surface of the granite removing the debris. Once you have finished this clean with Windex again then give it a final rinse with water. After the surface has thoroughly dried, take the flower vases and place them in position where you want them to sit. Using a ruler or measuring tape, make sure there is equal distance from front to back and then from side to side. Once you have them in position, take the painter’s tape or masking tape and use 3 small pieces of tape to mark the position of the vase. 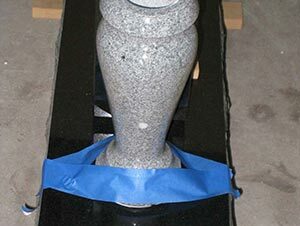 Then remove the granite vases and place them upside down on the ground next to the mounting position. 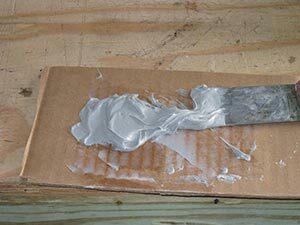 Next mix all of the epoxy using the putty knife and flat piece of cardboard or paper plate. Make very sure that epoxy is thoroughly mixed. You can tell it is mixed well when the color is uniform in appearance. If you are using an epoxy that was not provided make sure it is suitable for natural stone. Using the putty knife apply some epoxy to the bottom of the vase. Spread it all over the bottom for thorough coverage, then scrap it toward the center of the base. 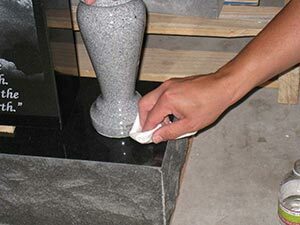 You’ll want to apply just enough so that when you set the vase and press down on it the epoxy thoroughly covers the space between the vase and the granite surface but it does not ooze out excessively from the sides. 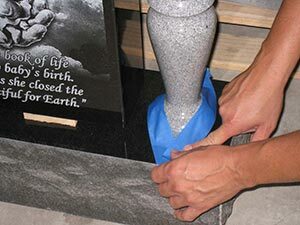 Since you have at least 15-30 minutes working time with this epoxy, it is best to start with a small amount and if needed you can always lift up the granite vase and add a little more. After you spread the epoxy on the bottom of the vase, turn it right side up and place it within the 3 pieces of tape you used to mark the position. 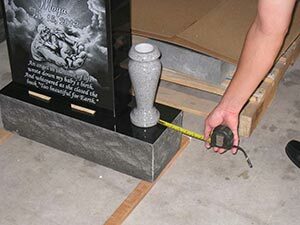 Make sure to locate the drain hole and position the vase so it points outward to the side of the monument and not the back or front. 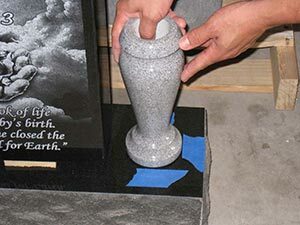 Use your body’s weight to press down on the vase to ensure the epoxy spreads evenly between the granite vase and surface. Remove the pieces of tape. 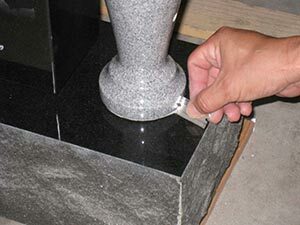 Using the straight edge razor blade, scrap up any excess epoxy that seeps out from the bottom of the vase. Then get a damp paper towel and wipe up any epoxy residue that remains. 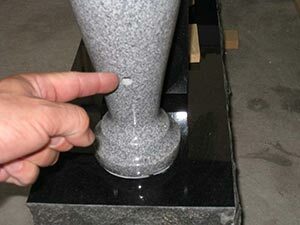 If the base of the monument is not level the granite vase could slide off its position before the epoxy fully sets. To prevent this get a couple of long pieces of tape and secure the base of the vase to the surface where it sits. This is to prevent the vase from sliding off its position while the epoxy cures. Please allow up to 24 hours for the epoxy to fully harden before you remove the tape.